Looking for tires for your car, truck or SUV? Give us a call. We stock tires from the great brands, including: Goodyear , Nitto, and Toyo. We also stock ATV tires. We’ve got the area’s largest selection of tires. Find your next set today. Your ride already has nice tires. Why not complete the look with a great set of custom wheels? 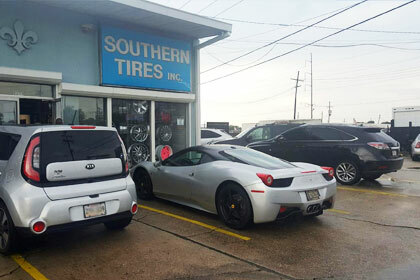 Southern Tire was the first company in the metro area to sell and install custom wheels. Choose from great styles and brands. Southern Tire has been in business for 44 years providing tires, wheels and auto repairs. Our easy leasing option from Progressive Leasing puts those custom wheels or new tires within reach. In the market for a quality used car? Come see us. Visit us if you live in Metairie, LA, New Orleans, LA, and all of Orleans Parish. We’re open Monday-Friday from 8:00 a.m.-6:00 p.m. and Saturdays from 8:00 a.m.-3:00 p.m. Schedule your appointment now--give us a call at (504) 737-1558. We accept many major fleet accounts. Want to add larger tires, add ground clearance, or just do some off-roading? A lift or leveling kit is for you. Stop in to check out our selection today.